This review deals, once more, with an older recording / re-release by Drone Records. This time I will not go to deep into the label, nor the band. When it comes to the label, I would like to refer to several other reviews I did for Concreteweb in the (recent) past for this label, and sister-labels Substantia Innominata and Transgredient Records. Just enter these names in the ‘search’ tab to find out more… I will not go to deep into the matter ‘Aidan Baker’ either. Well, you probable know who this guy is, and what he does / did in the past. In this multi-disciplined artist’s case too, I can refer to former reviews on his nameless outfit, or one of the many projects this Canadian guy is involved with. 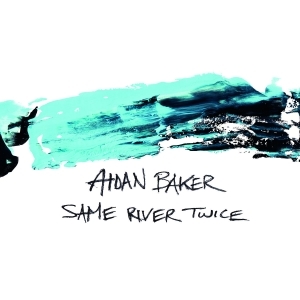 The 7” EP Same River Twice originally saw the light in 2004, also via the fine label Drone Records. Since this stuff was sold out (too) quickly, and seen the demand for it, the very same label had a re-pressing (300 copies) in Autumn 2014. With somewhat simplistic yet very intriguing new artwork, two great tracks from a musical mastermind have been made available once again –on green vinyl – and it is worth getting some additional support for sure. The A-side of this vinyl single starts with the title track, Same River Twice (7:46). This piece is a very mind-twisting one, a long-stretched dronescape that mesmerizes. It is fantastic to notice which ‘melodies’ can be created on guitar especially, sounding like layered synths. The slow, minimal piece sort of grows, with additional noises and loops, and there is some flair of neo-jazzy experimentalism too at the background. The back-side of this EP brings a composition with the eccentric title Some Of My Best Friends Are ¾ Water (7:40). This one has, besides guitars, also several percussion instruments (gongs, bells and so on) and flute, all performed by Aidan himself. The composition is little more energetic than the title track, and comes with a tribal atmosphere (especially several percussion instruments strengthen this tribal attitude). Despite the weird song title, this one is not meant to be a joke, yet rather transcendental, esoteric, hypnotic, almost levitating (just give the chance of levitation a try, and maybe you’ll float away to higher spheres; actually, this kind of Sonic Art surely accompanies the listener to those outer spheres! ).